Spending Time On Independence (Unintentionally) #WurmOnline – Nomadic Gamers, eh! 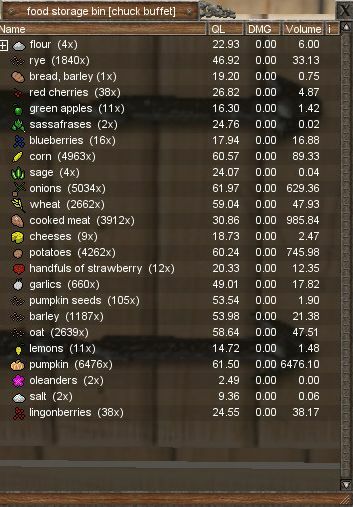 That screen shot above is the main reason why I have been spending my time between two servers, Deliverance, where my ‘home base’ is, and Independence, where I have a LOT of food stored up in a tiny little deed I own. I didn’t want to just leave it behind to rot, so last night I moved 2 characters back over to that deed so that my Vynora priest could work up his Hot Food Cooking skill. I mean, that’s a lot of food just sitting there. This of course was the start of a big adventure. See, I wasn’t sure what else I had left behind, but I thought perhaps I had left a few iron chunks that I could use to make into frying pans. I had grossly over estimated the amount of iron I had, and after 5 unfinished crafting attempts at a large anvil, I was out of iron. I needed a whetstone, I needed a pickaxe, and I had no iron or supplies on Independence to do any of this. As any great explorer does, I wandered. I found a pickaxe. I didn’t find any iron, but I did find a mine just across from my deed. I set out to gather some iron so that I could make a chisel, then a whetstone, then finish all of those anvils collecting dust in my forge, and THEN finally, perhaps make those frying pans that I wanted to make from the start. Nothing is ever easy. The moral of the story? ALWAYS keep your tools on you. You have no idea when you may need them. The adventure didn’t end there, I accidentally got the priest killed before I re-deeded the area, and had to walk him from The Howl (I believe that’s the name) to Colossus Lake. Without a compass. On a continent I was not familiar with at all. Thankfully, it was day time. My one saving grace. It took a while, but I made it. I deeded the land so that should any more mishaps befall my brave adventurer, I would at least be able to spawn in the general vicinity. There are a few differences between the enormous place that is Indi and the tiny by comparison Deli. Not just in size, either. On Indi I have been chased by every manor of aggressive creature, of all ages. The lands are absolutely teaming with life. There are ruins everywhere, the land has been incredibly built up over the years – but I find it much quieter than Deli. In my little area almost all of the deeds have been disbanded and are rotting away with a few exceptions. It makes for wonderful salvaging grounds. Also makes me miss my two horses that I let go when I first left, thinking I would have no reason to return. kchat (kingdom) is busy, and people seem quite familiar with one another. Deeds seem huge. Then again the map is quite large. When I’ve exhausted the supplies stored up I’ll bring the priest back over to Deli, provided I can find my way again. I may have missed a post or (knowing me) just plain forgotten, but why are you playing on two servers? Just for variety or do they offer different resources or gameplay styles or…?